A dead man on the back seat of the car, and warm milk at the farmhouse; An ancient little girl, and an old woman who saw the moon being made; A beautiful housekeeper with a monstrous smile; And dark forces woken that were best left undisturbed. I've heard nothing but praise for The Ocean at the End of the Lane since its publication, but while I love Neil Gaiman's work I didn't get around to reading his latest novel until this year. I have to be in the right kind of mood for Gaiman's work, but Natalie @ A Sea Change and I have been taking part in our own version of the Book Buddy-A-Thon and this was the book she chose for me so I was glad of the excuse to cross it off my TBR. For some reason I always find Gaiman's work difficult to review, but I like to try and review every book I read so here goes nothing! The Ocean at the End of the Lane follows our nameless narrator as he returns home for his father's funeral and finds himself reminiscing about a peculiar time in his childhood that involved a suicidal lodger, a monster in a beautiful disguise and three witches who lived down the lane. I've come away from The Ocean at the End of the Lane not quite sure how to feel about it. Like all of Gaiman's work it's beautifully written, so imaginative and wonderfully whimsical; it has a fairy tale quality to it, despite not being a fairy tale, as so much of Gaiman's work does, but having said that it didn't make me feel as much as I'd hoped it would. I love whimsy. I grew up on fairy tales, Disney movies and classic films like The NeverEnding Story and Labyrinth, but I find some of Gaiman's work more focused on whimsy than substance. I feel like I'm not being fair saying that because I liked The Ocean at the End of the Lane a lot, and parts of it are just beautiful, but I came away from novels like The Graveyard Book and American Gods feeling a lot more and I like to come away feeling something. 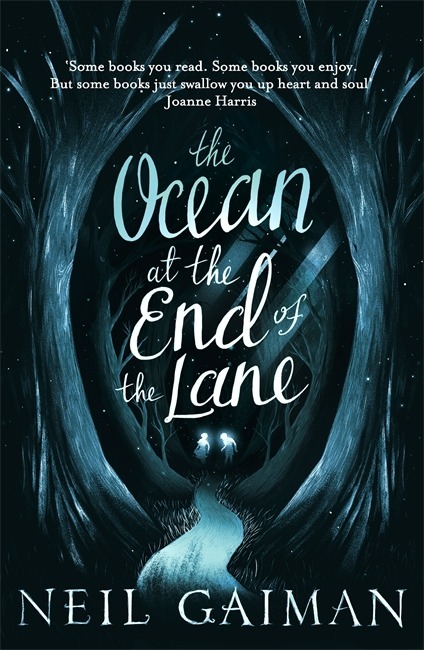 Basically what I'm trying to say, not very eloquently, is that The Ocean at the End of the Lane isn't my favourite of Gaiman's novels, but it's still wonderful and I still recommend you check it out. If you've yet to read any Gaiman this would be a brilliant place to start! I listened to the audio for this one and Gaiman does the narration so I think I enjoyed it more because of that.I definitely need to read American Gods soon.